This release adds improvements and bug fixes to v2.9.3. The download links are at the bottom of the page. We recommend that you back-up important plan files before installing any new release. Please let us know of any problems or issues you encounter with the release. 1. 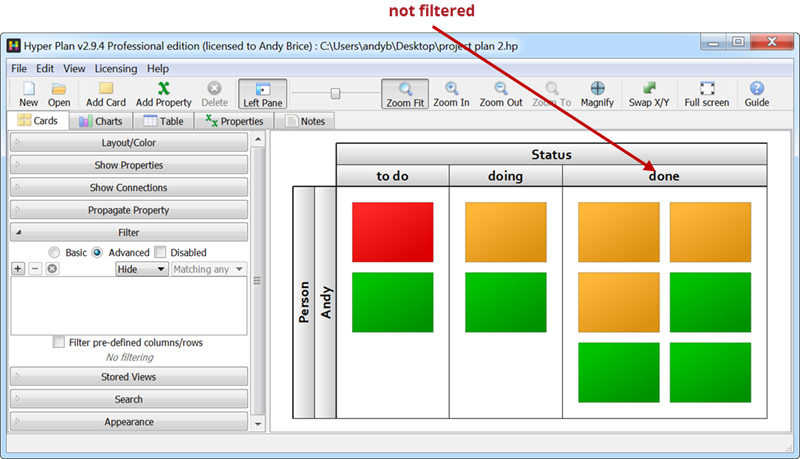 There is now a Filter pre-defined columns/rows checkbox in the Filter section of the Cards pane. 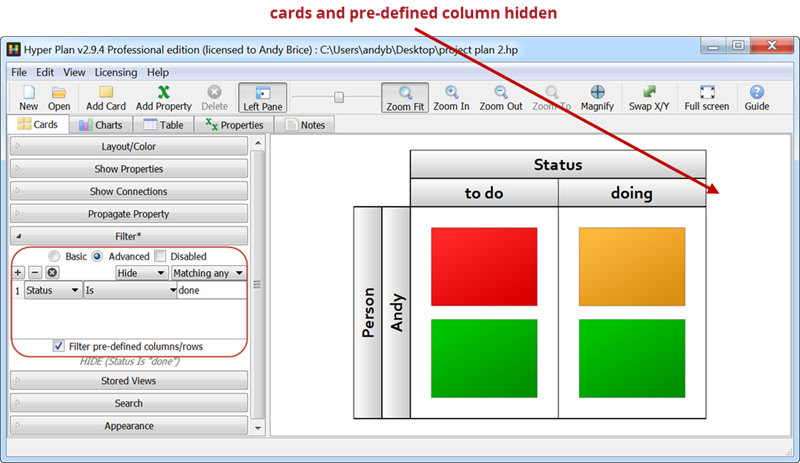 When it is checked the filtering is applied to both cards and pre-defined columns (the previous behaviour). When it is unchecked the filtering is applied only to cards. 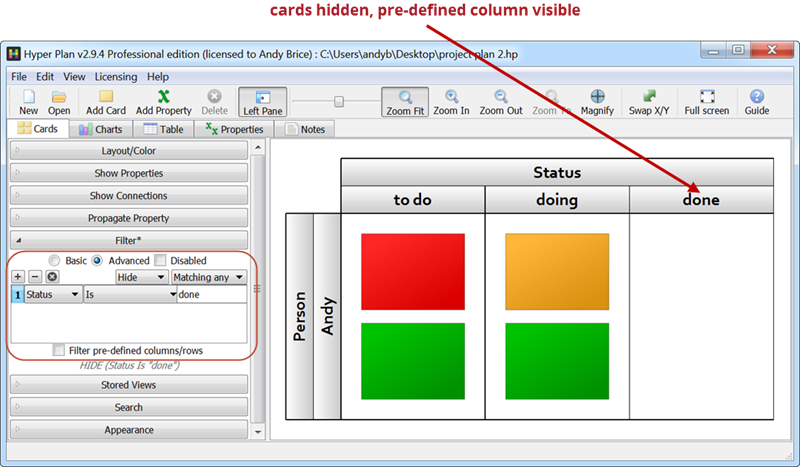 Unchecking this option is useful if you want to keep a pre-defined column visible, but hide all the cards in it. For example, you might want to hide all the cards with 'status'='done' but leave the pre-defined 'done' column visible so you can still drop cards on to it. 2. The Cards and Charts panes are now only redrawn when they are visible. This makes Hyper Plan more responsive, especially when modifying plans with 1000s of cards. 3. Previously textual property values with leading or trailing whitespace in their names (e.g. "todo ") were not shown in some charts. This is now fixed. 4. Hyper Plan now runs Microsoft's vcredist_x86.exe to ensure that all the system DLLs Hyper Plan requires are installed and up to date. This is considered best practice for systems written in C++ running on Windows, however it does add an extra 12 MB to the size of the install. 5. Hyper Plan now saves its plan file using an 'atomic' save (via a temporary file) on Mac. This means that it shouldn't be possible for another process (including another Hyper Plan) to be able to read the plan file when it is only partially written. 6. You can now close Windows using the Cmd+W shortcut. 7. Hyper Plan releases are now automatically scanned by Apple for malware ('notarized'). 8. Support for macOS 10.10 and 10.11 has been dropped. 9. Currently there is no dark interface option for Hyper Plan on macOS 10.14. We hope to add this once it is fully supported by the Qt framework.